Human microbiota are distinct communities of microorganisms that resides at different body niches. 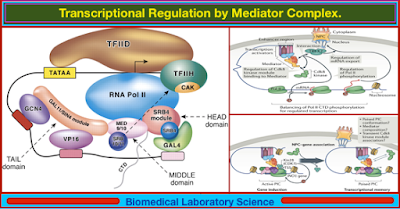 Exploration of the human microbiome has become a reality due to the availability of powerful metagenomics and metatranscriptomic analysis technologies. 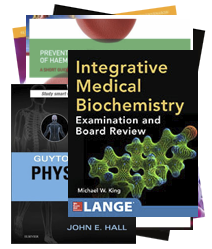 Recent advances in sequencing and bioinformatics over the past decade help provide a deep insight into the nature of the host-microbial interactions and identification of potential deriver genes and pathways associated with human health, well-being, and predisposition to different diseases. 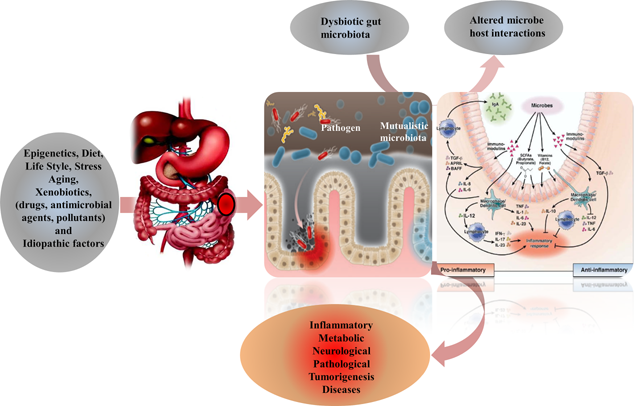 In the present review, we outline recent studies devoted to elucidate the possible link between the microbiota and various type of diseases. The present review also highlights the potential utilization of microbiota as a potential therapeutic option to treat a wide array of human diseases. Humans are viewed as composites of human and microbial cells. Human microbiota are complex and dynamic microbial communities composed mainly of bacteria, but also includes protozoa, archaea, viruses, and fungi that resides in and on different body niches such as oral cavity, throat, esophagus, stomach, colon, urogenital tract, respiratory tract, and skin. The number of microbial cells inhabiting human body is estimated to exceed the H.sapiens cells by 10-fold and estimated at 350 trillion microbial cells. Herpes gladiatorum: Facts, Symptoms, Causes, Risk Factors, Diagnosis, Treatments, Prevention and Outlook. Herpes gladiatorum is an infection caused by herpes simplex virus type 1, a virus similar to that which causes cold sores. It is common among those who engage in high-contact sports, such as wrestling, and is also known as mat herpes. Those infected with herpes will carry the virus with them for life as there is no cure. 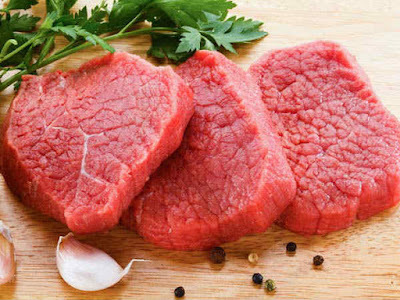 There will be periods where the virus is inactive and no symptoms are present, and times where it is active and causes various symptoms and flare-ups. When the virus is active, the person carrying it is infectious and can spread herpes gladiatorum to others. The virus can be transmitted by skin-to-skin contact and is easily passed from one person to the next. In this article, we examine the symptoms of herpes gladiatorum and the parts of the body that can be affected. We also take a look at diagnosis, treatment, and prevention of the condition. 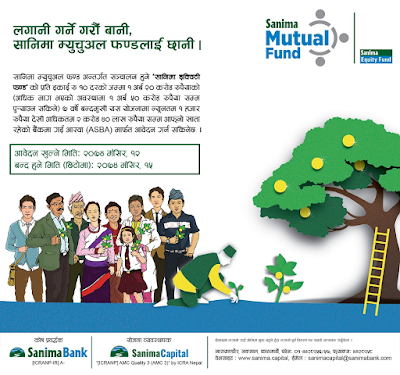 SEBON had compulsorily implemented Applications Supported by Blocked Amount (ASBA) system from Shrawan 1, 2074 for public issues (IPO/FPO/MF) and Sanima Capital Ltd. is the next company issuing its Sanima Equity Fund from full ASBA services all over Nepal starting from Tuesday November 28th 2017. 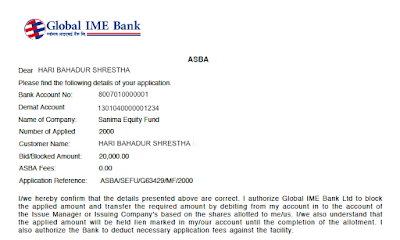 Global IME Bank (GBIME), like several other banks, has come up with online ASBA service registration of application for share with the aim to provide easy and efficient services to its customers. 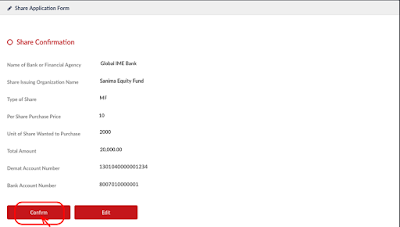 The customers can use ASBA services from either mobile banking or internet banking service without being presented at the bank and also at zero cost for the applications of IPO, FPO and Mutual Funds, such as, this Sanima Equity Fund. 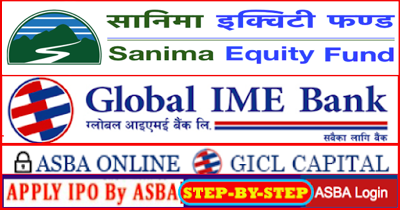 Applicants having account in Global IME Bank can apply Sanima Equity Fund through online service for registration of application. STEP 1: Open Global IME Internet Banking by clicking on the link below. 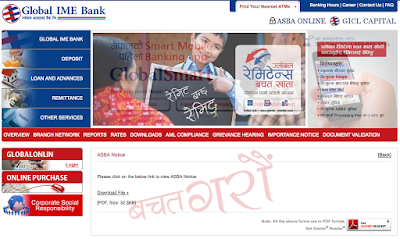 STEP 2: Position the cursor at ASBA ONLINE at top right corner as shown. 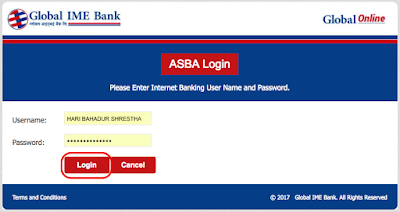 STEP 3: Click login after entering your online banking username and password as shown. 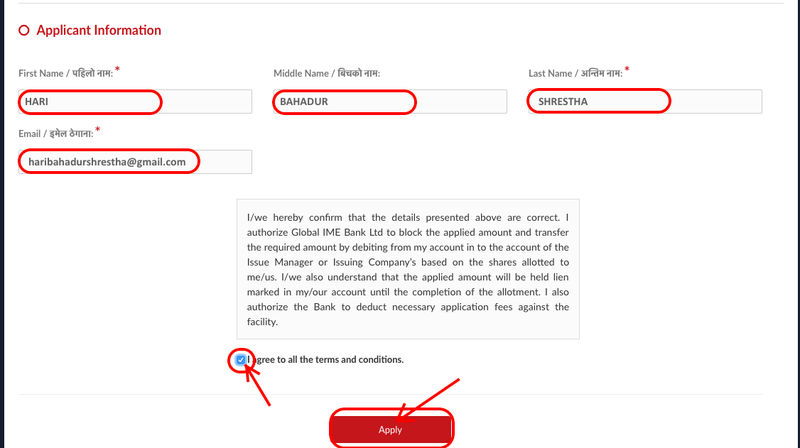 STEP 4: You will have 'Share Application Form' to enter your information details as shown as shown. the public offering for application submission. 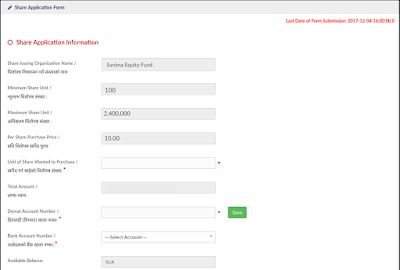 STEP 5: Complete the upper portion of the form with your information into the fields as shown. Note at the bottom the 'available balance' of your account ! 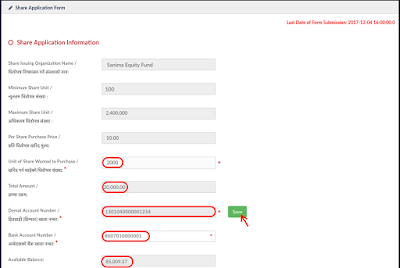 STEP 6: Scroll down and complete the bottom portion of the form with your information into the fields as shown. your agreement and thenclick 'Apply' in the red box at the bottom. 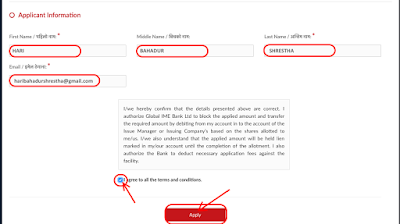 STEP 7: Click 'Confirm' (or 'Edit' if incorrect) for share conformation as shown. 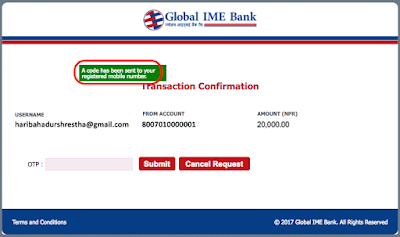 STEP 8: You will get a dialog box from the Global IME Bank on your screen displaying that 'A code has been sent to your registered mobile number' in green box with details as shown. STEP 9: Enter into the 'OTP' box the 6 digit code sent to your registered mobile number and hit 'Submit' in the red box at the bottom as shown. 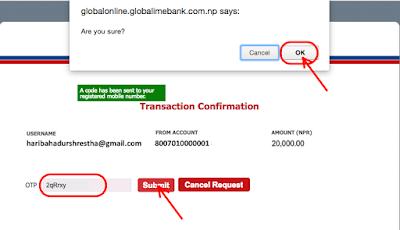 STEP 10: If everything goes well, you will get a 'Customer Verification' dialog box displaying 'Your account details has been verified successfully. ', then hit the 'Submit Form' in the red box at the bottom as shown. STEP 11: You will then be offered 'ASBA Receipt' dialog box with the 'PDF' icon link, click it to download your receipt as shown. STEP 12: Finally, save the pdf ASBA receipt for your future reference as shown. That is it! You are done!! Hope this helps & Good Luck!!! ALSO, CHECK THESE OUT TOO! 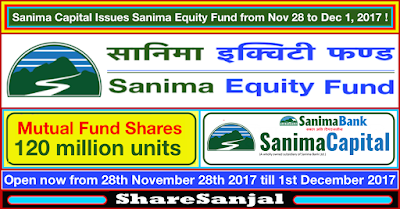 Sanima Capital Issues Sanima Equity Fund from Nov 28 to Dec 1, 2017 ! Support Microfinance IPO Starting from Tomorrow, How is the Company? 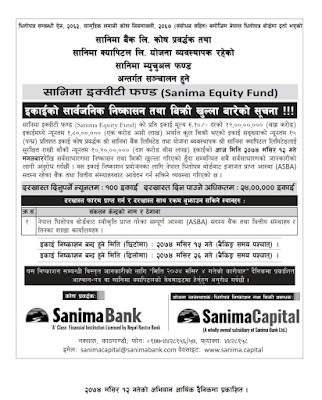 Do Investors Need to Apply Huge Amount on Upcoming IPO of Nepal Hydro & FPO of Pokhara Finance? 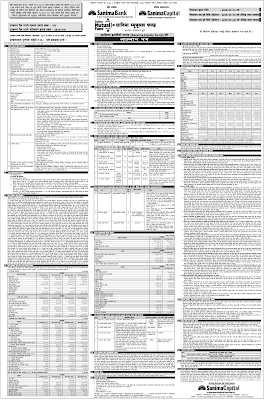 Nepal Hydro Developer Limited has published an offer letter to issue 3,90,000 units IPO shares to the general public from 27th to 32nd Shrawan, 2074. Nepal Hydro Developer Limited is issuing its 3,90,000 units IPO shares to the general public from today (27th Shrawan, 2074). Sanima Equity Fund is being floated its public issue of 120 million (12 crore) unit shares worth Rs. 1.20 billion (arba) for 4 days starting from November 28th 2017 (Mangsir 12th, 2074) till December 1st 2017 (Mangsir 15th, 2074). The Equity Fund is a closed-end 7-years equity oriented mutual fund scheme with fund size of Rs. 1.20 billion (arba). 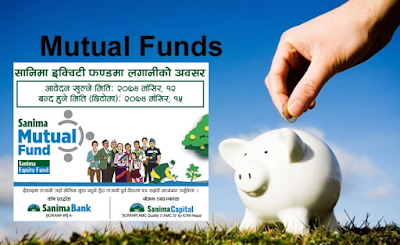 The mutual fund is managed by Sanima Capital Limited, a subsidiary company of Sanima Bank Limited (SANIMA), its fund sponsor. Out of the total units, 15 percent, i.e., 18 million mutual fund units have been allocated to the promoter of the mutual fund, Sanima Bank and the remaining units will be issued to the general public. The offer will close on December 1st 2017 (Mangsir 15th, 2074) at the earliest, else the maximum closing date for the offer is December 12th 2017 (Mangsir 26th, 2074). Interested people must apply for a minimum of 100 units of share and can apply maximum for up to 2.4 million unit of shares. The mutual fund will be issuing a total of 12 crore unit of ordinary shares worth Rs. 1.20 billion (arba) at face value of Rs. 10 per unit. Interested applicants can apply through ASBA-approved banks from all 75 districts across the country. ShareUpdateNepal: Wednesday November 29th, 2017 ! 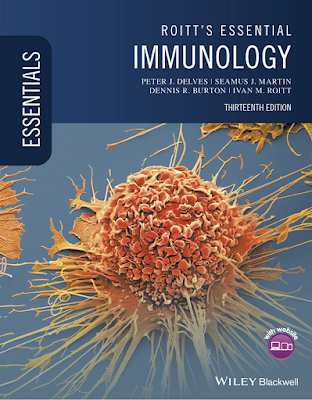 Roitt's Essential Immunology, 13th Edition !